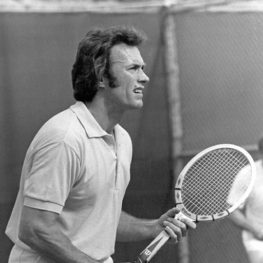 Clint Eastwood mid-match at the Toluca Lake Tennis Club. Photo courtesy of Toluca Lake Tennis and Fitness Club. 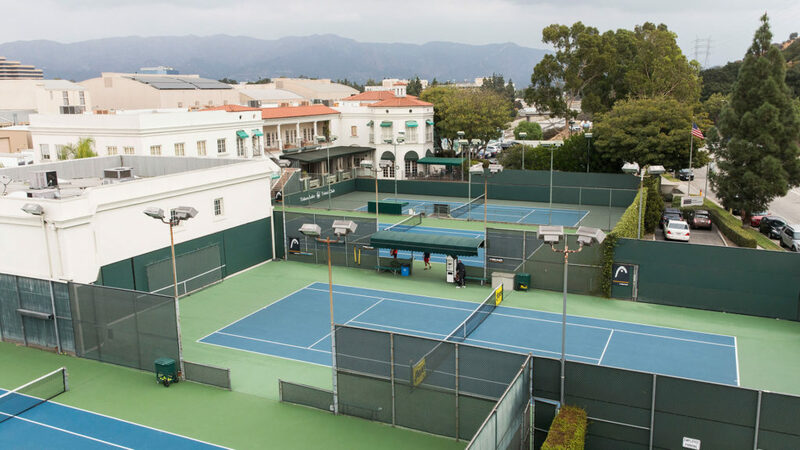 Considered one of the area’s hidden gems, the private Toluca Lake Tennis and Fitness Club — situated near the base of the Hollywood Hills and adjacent to major studios — mimics Toluca Lake’s small-town feel by providing members a welcome escape from the hustle and bustle of its surroundings. Its founders envisioned a space that encouraged a healthy lifestyle, friendly competition and, most importantly, a sense of community. 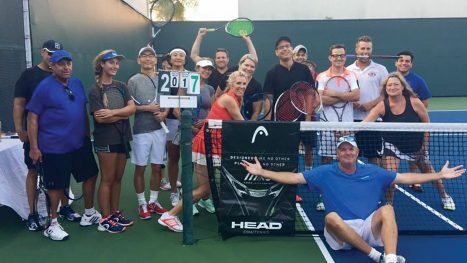 Forty years and counting, the club is fulfilling this goal, and its journey from tennis club to recreational mainstay is now a special part of Toluca Lake’s storied history. HOLLYWOOD HIDEAWAY The club’s low-key location drew a high-profile crowd in its formative years, with studio executives and regulars like Farrah Fawcett, Robert Duvall and Johnny Carson rallying on the courts or socializing in the shade over drinks. Photo courtesy of Bison Archives and HollywoodHistoricPhotos.com. STAR POWER Co-founder Wendell Niles Jr.’s celebrity connections can be partly attributed to his father, a Golden Age of Radio personality. Niles Jr. grew up surrounded by Hollywood performers, including Bob Hope, with whom his father toured to entertain troops during WWII. Photo courtesy of Toluca Lake Tennis and Fitness Club. With his real estate background, Ramsey was well equipped to handle the business side of procuring the property and overseeing construction of the Tennis Club facility. To build out the tennis program, he tapped Hollywood producer and respected athlete Wendell Niles Jr. as the club’s co-founder. Outside the studio, Niles was in demand as a playing partner by both pros and celebrities. In a 1971 Sports Illustrated article, he confirmed that he received a whopping 20 invitations a week to play tennis, qualifying that he usually only accepted four — from Dinah Shore, Robert Evans, Charlton Heston and Jennings Lang. 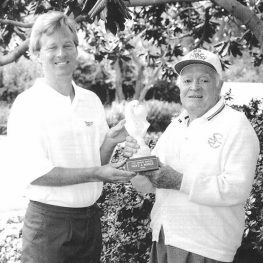 Niles’ experience organizing celebrity tennis tournaments served the club well, and he liked to get in on the action, too; he and Heston had a history of partnering up to dominate tournaments such as the Motion Picture Industry Tennis Doubles Championship, which they won in 1970. Niles also helped create the prestigious Monte Carlo Tennis Tournament in 1974, which he produced alongside close friend Princess Grace of Monaco. Thanks to Niles, the club became a haven for the Hollywood elite. Celebrities often dropped by to break a sweat in between filming, participate in tournaments or take private lessons. The court soon became an arena where agents negotiated business deals, stars showed off their athletic prowess and, in the end, everyone socialized over a round of post-game cocktails. Ramsey’s ties to business and civic community circles brought in an additional well-heeled clientele. This base of exclusive members contributed to the club’s immense success in its formative years. However, it wasn’t long before the Tennis Club grew to include the community at large and became reflective of Toluca Lake as a whole. 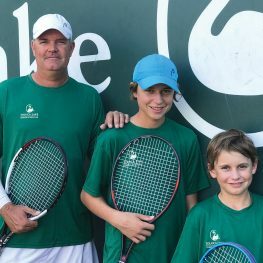 ACE INSTRUCTION The club’s signature tennis training program is internationally recognized, thanks to a pro staff headed by Tennis Director Ben Brunkow, a two-time USTA champion who has been at the club for over 15 years. Sons Gianluca and Lorenzo are youth champs as well. Photo courtesy of Toluca Lake Tennis and Fitness Club. By the ’90s, the club’s growing list of members signaled the need for expansion. Ramsey recruited his son, architect M. Paul Ramsey, to design a larger building and additional tennis courts, offices, a members’ lounge and a pool. The new design was based on the popular Mediterranean revival style, perfect for the Southern California climate. “Arches and pillars promote openness, so on warm days, a breeze can be felt through the outdoor pathways,” says James. Along with a new look and feel came changes in ownership. By 1991, Ramsey was the sole owner, but he wasn’t alone for long. A meeting with entrepreneur Randy Landsberger in 1993 shifted the club’s future. Marie Landsberger, Randy’s wife and the club’s current director of group fitness, says that the meeting between the two was fate. 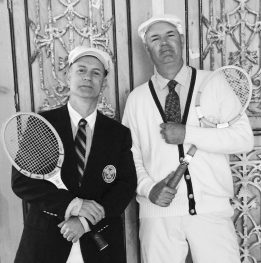 PLAYING WITH HISTORY Each year, the club hosts the Wimbledon Woodie Classic, a one-day public tournament that allows players of all levels to re-enact tennis matches of yore by using wooden racquets and dressing in period attire. Photo courtesy of Toluca Lake Tennis and Fitness Club. Randy, along with entrepreneur and friend Paul Philo, entered into business with Ramsey, and together they created the Sports Club, the strength and conditioning component of the club. Like the Tennis Club, the Sports Club quickly gained popularity by offering advanced workout equipment and personalized, private training programs. Members of the tennis side would join in on the fitness side, and vice versa, dissolving the boundary between the two entities. The new fitness membership spiked, calling for yet another expansion in 1999. A 4,000-square-foot building was erected to house a group exercise room, and cardio and spin studios. In 2002, the two sides of the club officially merged, offering a package deal for both. TEAM SPIRIT The club hosts its annual Member Mixer in September. Members work on drills, play against pros and try out new equipment, while also forging lasting friendships. Photo courtesy of Toluca Lake Tennis and Fitness Club. The new building enabled the club to develop its highly regarded group exercise program, which serves as a one-stop boutique gym accommodating busy lifestyles. Over the past 10 years, Marie has built the program into its current iteration by offering a dynamic range of in-demand classes such as yoga, spin and boxing. A self-proclaimed “class girl,” she champions the power of group workouts for their emphasis on bringing people together as a unit to motivate and inspire one another to reach their fitness goals. The program also continuously builds the community that Marie and her husband wanted. “Classes make people feel more connected to the club,” she says. Marie and James often hear members talk about the profound impact the club has had on their lives. James recalls meeting a young couple who felt displaced in the fast-paced environment of Hollywood, but found a “true community” at the club and were able to create lasting friendships with numerous people. Marie sees moms taking classes together, James recalls a wedding of two members that took place at the club, and both Marie and James have watched many children grow up over the years. The club also gives back, hosting — among other events — its Team Tennis Charity Challenge, which raises funds for a select charity each year. 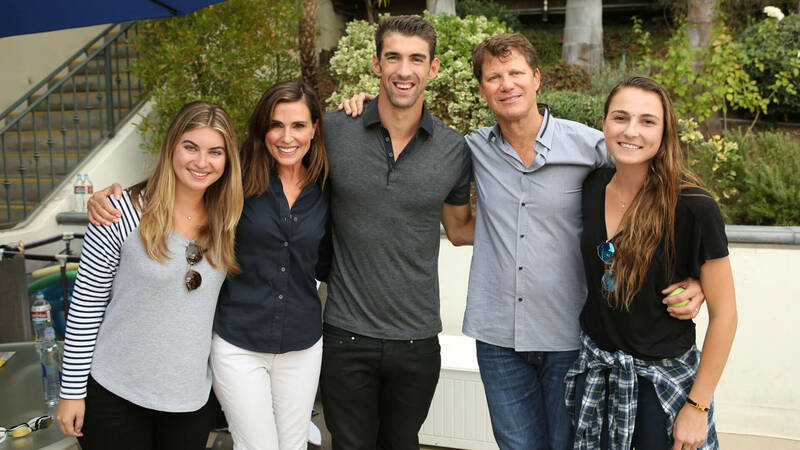 CELEB HOT SPOT The club still sees its share of celebrities, like Olympic superstar swimmer Michael Phelps (flanked here by the club’s Marie and Randy Landsberger, and members India Irving and Miquela Fiori). Photo courtesy of Toluca Lake Tennis and Fitness Club. 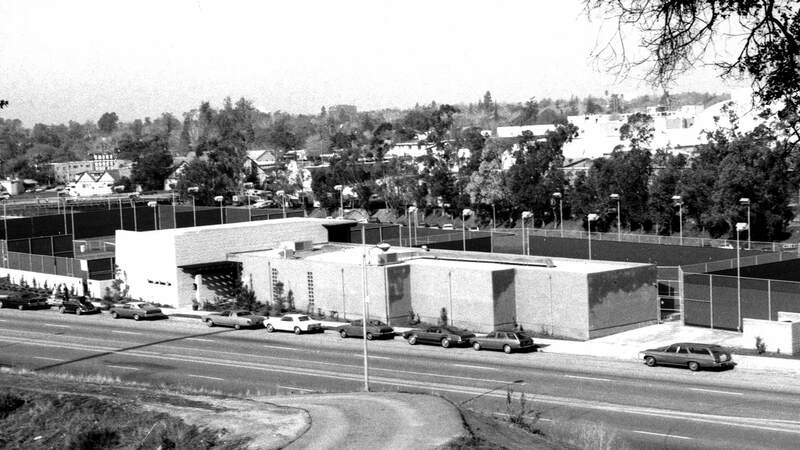 In 2013, Ramsey, Randy and Philo renamed the facility the Toluca Lake Tennis and Fitness Club. Today, James says the club is becoming less of a hidden gem and more of a sought-after fitness experience, through its continued innovation that nonetheless respects its roots. Old Hollywood charm, world-class tennis coaching, cutting-edge facilities and group exercise classes are behind the club’s high-profile membership and waitlist.